That’s So You! 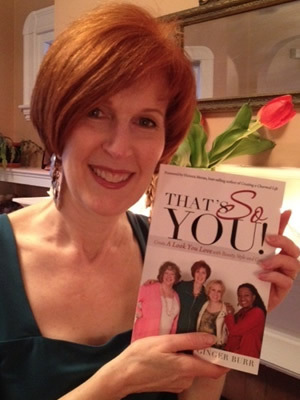 helps you create new awareness around the psychological aspects of how you dress, understand how to create a signature wardrobe that includes both comfort and beauty, make peace with aging and learn to do it with flair and confidence, so you can loosen these strangleholds on your personal style and create a look that makes your heart sing. You can benefit from my 30 years of experience for as low as $6 (on Amazon). I wrote this book to help guide you as you tame your closet, address real-life fashion questions, learn how to shop successfully and even help you age gracefully. Plus much more. Imagine how exciting it will feel to start creating a wardrobe and personal style that truly, down to your toes, expresses who you are. Learn how to stop wasting money on things you never wear. Ginger Burr is a fashion stylist and personal shopper serving clients worldwide from metro Boston.